Davis Instruments' newest wireless weather station is the Davis Vantage Vue. This high quality weather station provides accurate, reliable weather monitoring in a self-contained, easy-to-install system. The Vantage Vue gives you all the weather data you need for home use, education, boating and more. The outdoor sensor suite sets up in minutes and sends data wirelessly every 2.5 seconds to your console anywhere in your home, school, or business. You'll see current weather conditions, including indoor and outdoor temperature and humidity, barometric pressure, wind speed and direction, dew point and rainfall. You'll also get weather forecast icons, moon phase, sunrise/sunset times, graphing of weather trends, alarms and more. Vantage Vue also boasts the innovative Weather Center button that displays additional data on weather variables for today and over the last 25 days. The Vantage Vue is manufactured here in the U.S. Like its big brothers the Vantage Pro2 and Pro2 Plus it uses frequency hopping spread spectrum radio to transmit data. This allows it to transmit and receive data up to 1000 feet (line of sight) which is more than three football fields in length! 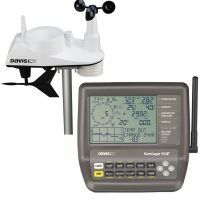 Browse the selection of Davis Vantage Vue weather stations and accessories that are currently for sale on eBay - you simply won't find better prices anywhere else! If you don't see what you need search here for even more weather stations.